My new paper, “Total Systemic Failure?”, is out (this link should get you a free copy for a limited time). I wanted to write something that was more a big picture look at how the world is working. Or perhaps how it isn’t working. I think there is a problem that the world is stuck arguing about whether climate change exists when it is a least possible that multiple global-systems are failing. I also wanted to write something that is very clearly about complexity theory and systems analysis. So what is systemic failure? The paper goes through how complex systems theory describes how the world works. It then moves onto the idea that if a system is put under enough pressure, and this starts to affect the relationships between the parts of the system, then that system could collapse. This might either be a change in the nature of the system, so that the global system behaviour changing significantly. Or it might be that the system collapses completely. We don’t have particularly good methods for understanding if a system is likely to collapse. How close it is, or if it is in the process of failing? We don’t know what we need to know. If we did then we might be better able to understand which systems are likely to fail, and perhaps what we might do to change that. So what is different about total systemic failure? Here we are asking the question of if a number of systems start to fail, will this result in all systems failing? Systems are connected, and the degree to which they are connected and the significance of these connections is difficult to understand. Therefore, could the failure of one system precipitate the failure of another system? If this happens could it cause a cascade of failures? We do not understand how individual systems failure, we are even further away from understanding how a system-of-systems might fail. We need to work out what state we are in, perhaps there are things we can do. Perhaps there is an opportunity to build a connected, distributed, sensor network that can provide data on global systems? It will not be easy to build this network, or analyse the data. Artificial intelligence could help, perhaps we can build AIs that can help develop the sensor network and also analyse the results. A global distributed sensor network. The AI could learn about what data is needed and what interventions could be made. We need to start thinking more about the big picture. Otherwise we are going to find ourselves in a real mess with little hope of getting ourselves out of it. 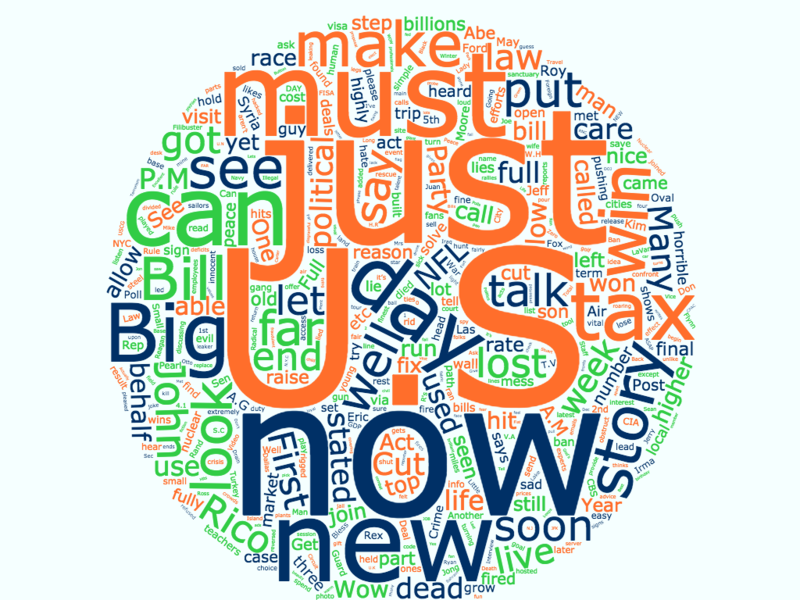 I re-did the President Trump Twitter Word Cloud, the updated word cloud is below. I now have a version of Twitter4J that has the capacity to download the extended tweets of 280 chars. Also trumps tweeting is pretty high volume so the topics have changed through time. 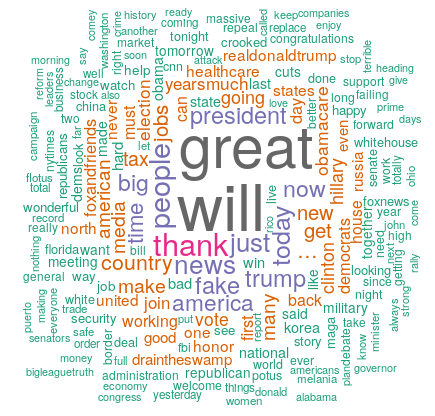 I used twitter4j and R to make a word map of Donald Trump’s tweets. I thought it would be interesting to see what his most used words are. The program downloads 3000 of his most resent tweets, unfortunately it cannot download all of the extended mode tweets. Only the first 140 characters. It wasn’t that interesting in the end. I have processed more of the Daniel Morgan data, and thus have an updated network of the data. 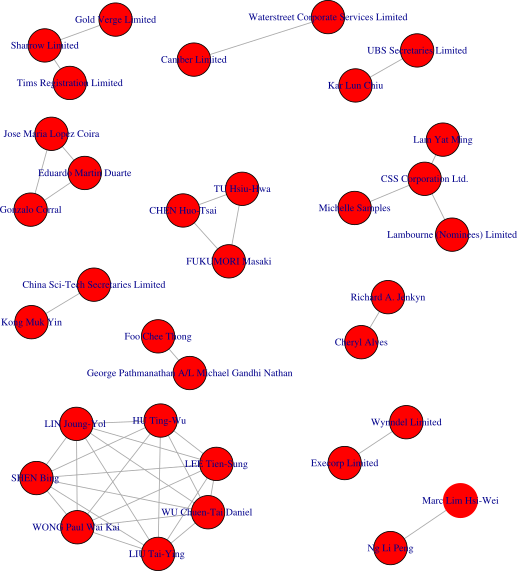 Below is a visualisation of the data produced by extracting the network structure from Neo4J using R and iGraph, then saving the network as a gexf file and importing into Gephi. The network is more complete but also has edge labels. Updated version of the Daniel Morgan data. After listening to the Daniel Morgan podcast, Untold, I became really interested in the murder investigation. To help me follow it I started building a network of all the key people, organisations, and events in the case. The networks this produces can be seen here,and you can keep up-to-date with the progress on the network here. There is an updated network image here. The story is a compelling one, I suggest you either listen to the podcast or read the book. Very briefly it looks into the murder of Daniel Morgan, and the subsequent investigations into the murder and the police handling of the murder. The book builds a compelling story of decades of struggle by the Morgan family to get justice, and the difficultly they have had in discovering the truth. The network is not complete, at the time of writing I have only put in the ‘easy’ bits. The network stores objects as the nodes, so people, companies, organisations. The lines, or edges, store the relationship between the objects, e.g. Alistair Morgan is ‘brother_of’ Daniel Morgan. 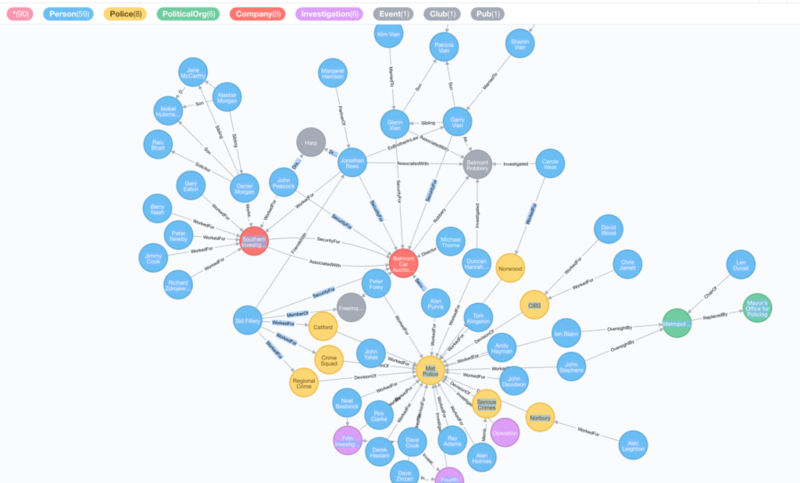 The visualisation is produced using Alchemy, and the data is stored in Neo4J. I intend to continue to develop the network further, and the visualisation which needs things like edge labels. Once the network is more complete it would be interesting to see if there is any useful analysis that can be done on the network. It would also be interesting to expand the data to include other related and interesting cases. Such as the Stephen Lawrence murder, and the Leveson Inquiry will likely form a part of Algorithmic Indexing in the future. 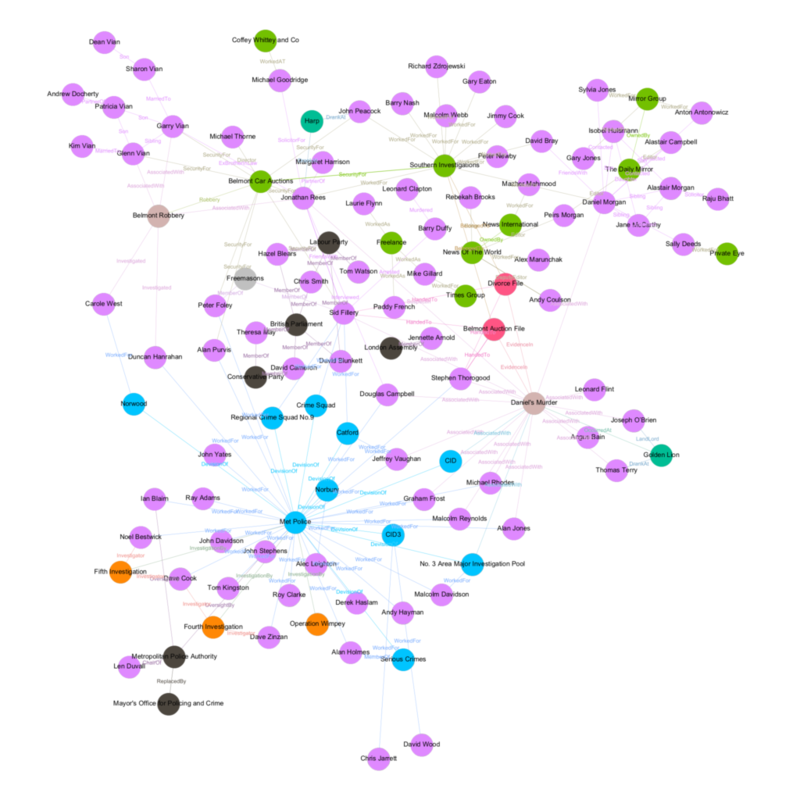 Part of the network of actors in the Neo4J database.